Ka-Bloom is a stylish, attractive puzzler by BBC Worldwide. It's a brightly-colored, slick app that one certainly wouldn't assume is being given away for free, and actually does a great job of setting itself apart from the pack. Floret, your avatar throughout Ka-Bloom, is actually a type of interstellar seed. 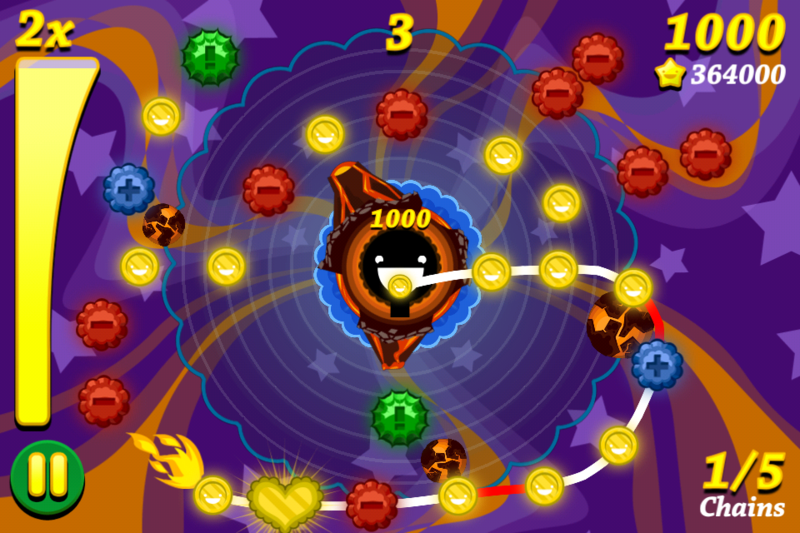 To make Floret grow ever larger, you need to arrange neon gems and special coins via three chain-links at a time. Blue gems must be consumed entirely to advance to the next level, so when you're given time before the timer starts to arrange them as you see fit, it's a good idea to strategically place gems so the blue ones are snapped up last. Collecting all the blue gems with Floret is actually the least of your worries, though. Multicolored gems amplify Floret's reach, others shrink the area of effectiveness, and others give Floret a bigger area in which to maneuver. You needn't be concerned only with expertly manipulating gems before the level actually starts, though some allow you time during levels to chain gem combos while the game is actually in motion. Sometimes you'll be required to jump straight in with zero planning, and must chain together combos on the fly. That's when things really heat up. Ka-Bloom can become downright humdrum at certain intervals once you've gotten used to its deceptively simple play style, but serves up a fast-paced challenge that puzzle lovers feeling a little jaded by current offerings should enjoy. Touch control is sensitive and quite responsive, and chaining together gems feels natural. The repetitive looping sample in the background can grate on the nerves, but is easily alleviated by playing with the sound off and listening to your own music. The three-star rating system that seems to be all the rage these days returns, giving players a goal to shoot for--improving times and scores for a better rating each time. It's easy to achieve a three-star rating if you pay close attention and continue improving over time, but realtime chaining can prove difficult at the onset, which is a demanding challenge puzzle fans should eat up. Ka-Bloom is a full-featured and entertaining app, especially for the low price of free, and has plenty to keep you engaged on the commute to work or that dreadful wait at the dentist's office. It's impressive for free, and definitely an interesting puzzler if you're looking for something new to try. Just don't expect it to last too long.